Blair House Inn is 150 miles north of San Francisco. It is a 3-½ to 4 hour drive via US 101 & CA 128. If you prefer to take the Pacific Coast Highway, (CA 1), along the coast, allow at least seven hours. It’s best to fill up your gas tank on the 101 corridor before heading to Mendocino. There's one gas station in Mendocino, and it's very expensive. Fort Bragg, ten miles north, has competitively priced gas. ** From Highway 1 at Little Lake Rd. 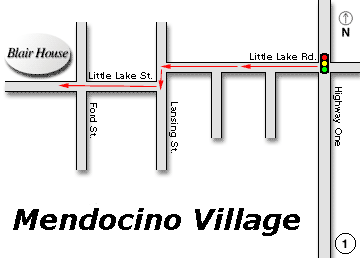 Go three blocks west on Little Lake to Lansing Street, where Little Lake takes a little jog to the left. Stay on Little Lake for one more block and you’ll see Blair House on the corner of Little Lake and Ford Streets. 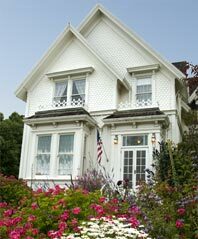 Blair House is the large Victorian house with a white picket fence.